From St. Louis Post-Dispatch: My first union meeting was, well, uncomfortable. It was around Christmas time in 2008. I was a relatively new member of the United Media Guild. Because I worked out of the Jefferson City bureau, I thought coming to the union holiday party would be a good way to get to know some of my colleagues. Midway through dinner, a union official was offering a rundown of various grievances filed over the past year. One caught my ear. There had been a layoff a couple of months after I was hired. Generally, it’s last on board, first out the door in such situations. I was passed over. The employee who was laid off instead of me filed a grievance. She was going to win, the union officials declared to applause. “Are they talking about me?” I whispered to Tim O’Neil, the since-retired Post-Dispatch reporter who was the shop steward. Nearly 10 years later, I received a political advertisement in the mail the other day that made me think of that meeting. If you live in Missouri, you’ve likely received one like it. It’s from Americans for Prosperity, the Koch Brothers-funded nonprofit that works consistently to tilt the American playing field away from people like me and toward the oligarchs who run things in this country. On its surface, the mailer would seem to speak to somebody like me. 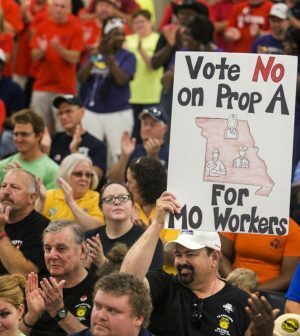 It suggests that Proposition A, which Missourians will vote on Aug. 7, will protect workers from out-of-control union bosses. The mailer is an attempt to confuse voters, and when it comes to Proposition A, it’s easy to get confused, because the initiative’s route to the ballot was circuitous.